"The vast majority�more than 95% of the individuals�who cross that one year mark without clear signs of consciousness are not going to recover consciousness after that." Decades of poorly written television and movies have often relied on the sloppy plot device of having a character suddenly wake up out of a coma, eager to offer important information or vital clues, and then immediately get on with their lives as if nothing had ever happened. As if the coma was just some kind of big sleep. I think most of us know that kind of thing doesn't really happen, but naturally unless you have experienced it directly somehow the reality of what occurs�the loss of memory, voice or motor skills, decreased brain function, rehab�would remain a mystery to many of us. 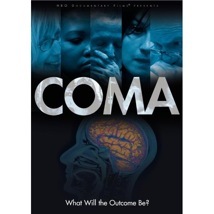 Coma�not to be confused with the 1978 Michael Crichton thriller�is a 2007 HBO-made doc from Academy Award-nominated filmmaker Liz Garbus (The Farm: Angola, USA). Garbus spent a year or so following the lives of four patients and their families at The Center For Head Injuries at the JFK Medical Center, as the meanings between such labels as "minimally conscious" and "vegetative state" are examined. But this is far from some dry medical documentary, as Garbus goes way up close and personal instead, using the drama involved with the varied post-coma recoveries of patients Tom, Al'Khan, Roxy, and Sean, each of whom suffered some level of severe brain trauma as a result of an accident. We are introduced to the families and medical staff, as well as the patients, and Garbus adopts a silent companion approach to the filmmaking here, allowing the participants to speak without prompting from an offscreen interviewer. Periodic title cards fill in small details or time passage, but by and large the narrative is propelled by the people involved. There are family meetings with doctors where bad news is given, tears shed in waiting rooms, and the cameras take it all in, yet somehow doing so without feeling unnaturally obtrusive. Clearly Garbus needed the permission of the families to give Coma its personal touch, and it is their unselfish openness�especially during so many instances of intense grief and frustration�that fills this doc with a texture of almost being too close. There is only time in the finished print when a family member requests that the cameras be turned off (after receiving a particularly distressing prognosis), yet it is done with compassion instead of anger, almost as if they were being apologetic to the filmmaker. Despite my hopes that all four subjects would walk out the hospital by the doc's end, I knew that unlike a bad television show, that this was real life, and things do not always go according to plan. The progress of some of the subjects is ultimately inspiring and perhaps even hopeful�yet still tragic regardless�but when condensed over 100 minutes it makes the unimaginable daily stress and emotional strain the families underwent seem somehow cruelly compounded. And while I waited for some miracle recovery to occur, it was the families that were the ones I found myself truly grieving for. There is a great degree of unenviable personal drama on display here, yet Garbus assembles it with care and compassion. And the simple beauty of Simon & Garfunkel's For Emily, Wherever I May Find Her will never ever be the same again, and will likely bring me to tears. Image Transfer Review: Coma has been issued in its original 1.33:1 fullframe aspect ratio. As a doc, the transfer doesn't have any horrendous flaws, and the compelling nature of the narrative even downplays the obvious fact it was shot fullframe. Colors, however, are somewhat drab, but much of that owes to the on-location shooting employed by Garbus and her crew. Some sequences do carry noticeably more resplendent fleshtones, but typically palettes appear fairly soft. Periodic grain is evident, as well. Audio Transfer Review: The principle audio track is presented in 2.0 stereo. Recorded in hospital rooms, hallways, and moving cars, dialogue quality tends to vary periodically, though it never is undiscernable. The track does have a very live feel that I imagine only enhances the "you are there" effect. Brief elements, such as the well-played use of a Simon & Garfunkel song, do carry a bit more heft. Simple, but truly effective. Extras Review: There's just one piece of supplemental material, but it merits a viewing. Garbus directs The Case Of Willie Hicks (18m:18s), which feels like an excerpt from the main doc itself (in fact Hicks is visible in a few of the group sequences) and follows his post-coma recovery. As with Coma, this segment is heartbreaking, though tinged with far more hope. There may not be a lot of answers here, but the moving force of the personal stories presented by Liz Garbus are tragic, heartbreaking, and at times somehow promising. The "fly on the wall" approach, and her ability to be included in some very private family moments, lend this doc the kind of raw honesty that makes us feel as if we are there, sharing all the grief, pain, and hope.